OK. I think we’re all a little freaked out by Bill 60. I mean, it was all fun and games until the PQ actually tabled it at the National Assembly. Now, we can no longer pretend that it was just some summer prank. It looks to be a real issue that we’re really going to have to do something about. Fortunately, Jess Solomon has a solution. She has drafted a revised Charter of Values. 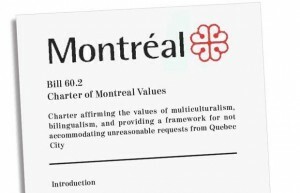 Check out Bill 60.2 – Charter of Montreal Values: Charter affirming the values of multiculturalism, bilingualism, and providing a framework for not accommodating unreasonable requests from Quebec City. Published by Adrienne Piggott on 2013/11/22 at 16:51 under Quebec Charter of Values.